ini file — . :: GSA SEO & Marketing Forum ::. ocr remove="captcha presented by xyz"
Trying to replace something but can't get it working. If so what is the right typing? Thats working but of course not in the SDK itself. The SDK is just for you to define filters and such. 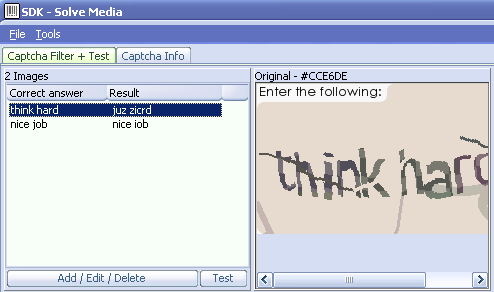 The remove/replace takes place when solving a captcha and modifying the actual result. Thanks for that but how to modify final result? It's really what I'm looking for. well as written in the sample, just remove the ";" in front of the line and the replacement/removement takes place. 1. Maybe it's just a sample but this is not going to work. I see no use in doing it here. 2. Again in the SDK it is not used. The SDK is just for you to define filters and the the REAL OCR result. The stuff in ini files is done when really solving live captchas. OK . Can I try it from "options->test" menu? I mean I will save some captcha to harddrive after test it? Yesterday I was trying what you told but without result. ;ocr remove="captcha presented by xyz"
Please note, it says AFTER delivering OCR results, and thus - is it possible at all and where and how it can be done if its possible in GSA captcha breaker? well maybe it's a language problem here. But what else do you expect now? Remove the ";" at the start of the line and CB will do whats written there. You might have to restart CB in order to take changes of the captcha ini files in effect.